Every month i'm shocked when a favourites post rolls around because the months seem to be absolutely flying by for me this year, as I am probably the busiest I have ever been. This month I have discovered a few gems that have really impressed me, and will be firm favourites over the next few summer months! With the weather being so beautiful at the moment i've been pulling out products that I wouldn't typically use all year round but have been life savers these past few weeks, as well a few new products that have majorly impressed me this month that I just had to tell you about! For me summer is my favourite season, although being a natural ginger I do find the heat to be overwhelming at times I love nothing more than dressing for summer but with that comes my very pale skin so i've been fake tanning quite a bit recently. I'm planning on doing a separate post on my favourite tanners, but one product that I love to use on top of my tan after a day or two is the Sanctuary Wonder Body* (£9) which is a body lotion with a slight tint that just gives the skin a lovely glow and kind of evens out a tan if it has gone every so slightly patchy! I love this as it makes my skin look so healthy and feels so smooth! A cleanser favourite of mine for a little while now has been the Superdrug Vitamin E Hot Cloth Cleanser (£4.99), but more so recently because my skin has been super shiny but still quite dry and this has been amazing at removing my makeup but without leaving my skin feeling stripped. For a more budget cleanser this has really impressed me, to the point where it may have topped the Liz Earle Cleanse and Polish, which i'm not complaining about because this is the third of the price and does just as good a job, maybe even better! Finally we have two products from Rimmels latest collection release, which has really impressed me over the past two weeks! Their Insta Duo Contour Stick* (£6.99) has been my go to cream contour for the past couple of weeks, as it gives such a natural contour that I absolutely love and it's so easy to work with! The other product from the collection that i've loved is the Insta Fix and Go Setting Spray* (£6.99) which has been an absolute life saver with this hot weather recently. I've never tried a setting spray before, and for the first one to try it has really impressed me and has made my makeup stay put longer than usual! 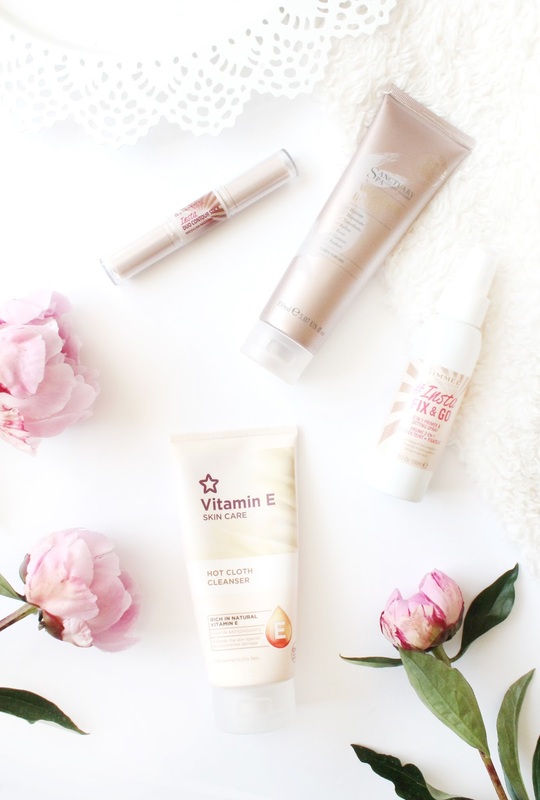 So those are the products i've been loving these past months! What products have impressed you recently?